............ And under it all there is me somewhere! As the stitching process has come to an end, so the creative part of photography and combining all the elements to make a slow stitch kit has been done. I keep thinking did I really say I would produce these. I am not a huge business and I do not have employees, it is just me! I think I am going to have a launch party with just me, myself and I as well, or maybe just have a good sleep! So the first kit has four designs going out as a series, Hare seasons. The kit comes in a custom made box with a contents sticker printed on the inside. It is all beautifully wrapped. There are four of my own hand drawn illustrations which been professionally printed as iron on embroidery transfers. There are four pieces of hand cut antique French linen circa 1900, and it is gorgeous. Each piece of the linen is approximately 6 x 6 inches There are also four antique mother of pearl buttons in their own little glassine envelope and still on original card. I have included instructions and a note from me. Each kit is numbered. 1 to 40 as this a strictly limited run. They will never be re printed, and they are a one off series and unique to Homespun Stitchworks. I have had photos taken of the four designs that have been hand stitched in the colours I personally like, but of course when I did my survey the majority of you said you would prefer to use your own threads and colours so it is just an example for you to see my finished designs. The kit is offered at £49.50 and that includes postage within the UK however if you are outside of the UK I will be glad to post to you at cost. I am going to let my readers have the chance to purchase this limited addition before I make them available to the public. So any orders received before Friday 23rd March will be honoured on a first come first served basis. You will need to comment with the word SOLD on my blog or on FB Homespun Stitchworks page and send me your email address for a pay pal invoice. I had such a week last week and it was both fabulous and gruelling .... Manufacturing my first kits has been a wonderful journey and I just want to thank you all for your encouragement, inspiration and for asking so nicely for me to design for you. 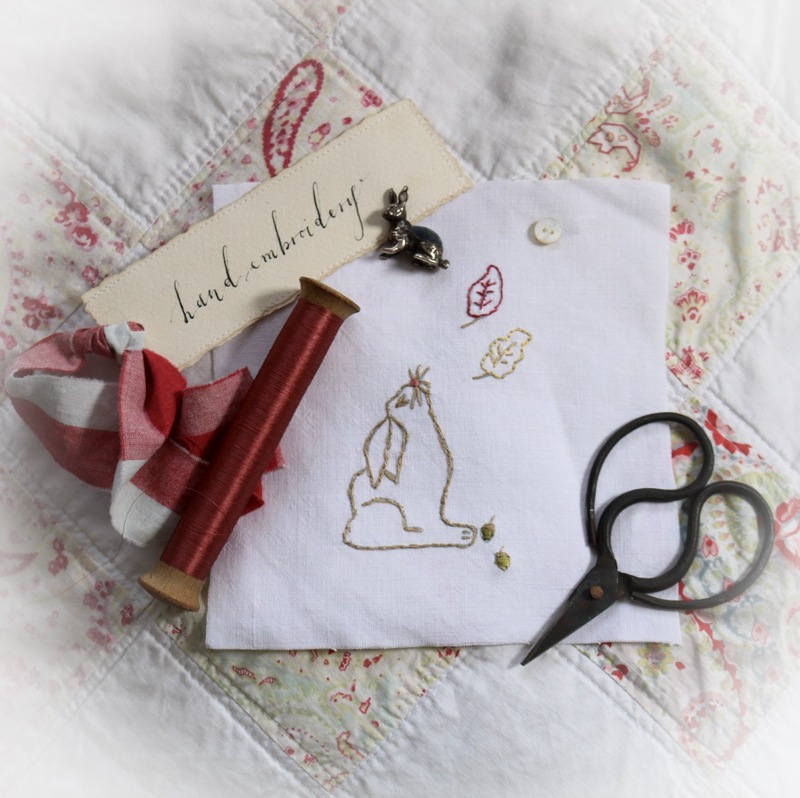 So, to my designs ... there is Hare in Spring with tiny snow drops looking up at the stars and the button moon. Then there is Hare in the Summer looking up at the button moon and dandelions with tiny little spores floating in the Summer breeze. Hare in Autumn is looking at leaves blowing under the button moon and the acorns on the ground and lastly Hare in the Winter is gazing at the snow flakes falling under the Winter full moon and she is watching the flakes dance around her in wonder. The little Hare is called Harriet , I have fallen in love with her over the months and she is very special to me. There is a little of me in every design . You can make a wall hanging of all four or indeed cushions. You could frame them. The other idea if you would like is to keep the vintage linen for other projects and iron the designs or design onto a piece of clothing and then embroider it to make your chosen item unique to you. The choice is yours. Harriet is going on one of my dresses. Other news is that I went to The Vintage Bazaar on Saturday and took photos so I will be reporting about that this week, it was amazing as usual. I love the VB and it is such a great way to kick of the vintage fair season! The snow was falling in the gorgeous market town and was bitterly cold. Not so inside the lovely music was playing and everyone was smiling and happy. I bought a few treasures at the VB and I will show you later in the week. I must collate the photos and I will report on the the Vintage Bazaar as well. My little basket of hand stitching is by my chair and the fire is ready to light, I feel much calmer and happy now that the kits are ready to be offered for purchase. I am now going to make a warm drink and snuggle up in this further cold weather spell and resume my other slow stitching commitments as well as do a little of my own stitching as a celebration. Ahhh! I will be back here tomorrow morning so I hope you will all join me then. Oh what a pretty little hare, and she has a name - Harriet, one of my favourite names too. Its bitterly cold here, and I am so glad my dad is here too, I couldn't visit him yesterday, as we could get into town but not sure we would have got back up the hill. My dad used to live in Okehampton. I couldn't visit him yesterday, we could get into town but not sure we would have got back up the hill again. It’s snowing again here, was not forecast at all! .. it’s icy here . I am staying in today, hope you are cosy. Sorry...your Harriets! My spell checker keeps changing it.